Once upon a time, in a land close enough to be mighty familiar, pharmaceutical companies manufactured medications, people took them--and got better, or not, pretty much the same as now--and, although the companies did very well for themselves and no one had to collect money in cans for them come Christmas-time, the concept of a 'blockbuster,' or the idea that one single medication could earn its maker a staggering $1 billion dollars (the amount required to earn the title 'blockbuster') was simply unknown. In fact, it took the help of aggressive marketing, Woody Allen (who gave the drug a cameo in several of his films), and, of course, the Rolling Stones, to help our ‘Mother’s Little Helper,’ also known as Valium, become the first drug ever to reach $1 billion in sales. What a difference 50 years makes. 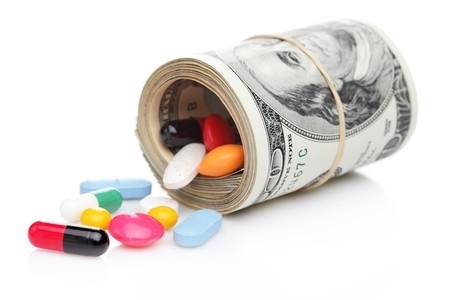 In 2012, 61 medications made over $1 billion--in that year alone. It is certainly true that--from the outside--it looks like drug companies live on easy street, just sitting around on Herman Miller chairs, figuring out how to spend all the money pouring in--but the reality is that they invest billions of dollars every year into research and development. However, according to Medscape, only one out of every 5,000 to 10,000 compounds that the companies study in preclinical trials actually makes its way to market (after approval by the FDA). And of those, very, very few ever become blockbusters. You don't have to cry for them--but it is more complicated than it initially appears. So, what would YOU think the five most profitable drugs ever developed are? Go ahead, don't be shy. Let me start you with some hints. Several factors play into whether a drug achieves blockbuster status: 1) the need among the population at large; 2) the success of the drug company's marketing to the public; and 3) the success of their marketing to physicians. And let's not forget the cost of the drug itself, which can be staggering. And finally--cynical as this seems--there just might be one more little piece of the puzzle that factors into what makes a drug a huge earner. Once upon a time in the days of medicine-making, points out Anne Pollack in The Atlantic, before the twentieth century, the name of the game was dealing with infectious diseases. With antibiotics and their ability to wipe out certain diseases came a breakthrough that essentially created the contemporary pharmaceutical industry. But the thing about antibiotics is this: the sick person takes them for a certain amount of time, and then (with some good luck thrown in), he or she is cured--and no longer needs the drug. However, such self-limiting usage is problematic for a medicine's bottom line. Martin Kuehne, a chemist at the University of Vermont, famously said, "Pharmaceutical companies don't like cures. Really, they don't -- that's the sad thing. They like treatment. Something for cholesterol or high blood pressure that you take for years and years, every day. That's where the profit is." Keep that in mind as we look at the five most profitable drugs ever developed. Back to your guesses. Thinking along the lines of Viagra? Of Prozac? Of Oxycontin? Not one of them makes a 2012 list of medications that generated revenues over $5 billion. Are you convinced you're really in the know, just skimming over this, sure you’ll see the same top five as you have for years? If so, don't be disappointed. You won't see "the purple pill," nor will you find one atypical antipsychotic--not one--on the list of bestselling drugs of all time. In fact, if you just look at the list below of the top selling drugs this year alone, you'll find some big best-sellers are missing--out in the cold--and 4 out of the top 5 are something called biologics (I'll come back), which tells us that the pharmaceutical companies have entered a whole new era. So here we go, the five bestselling drugs of all time, at this exact moment (because it IS going to change, and fast), starting at the bottom and working our way up. Enbrel is one of those 'biologic treatments,' or, if you're really 'in,' just a 'biologic,' used for rheumatoid, juvenile and psoriatic arthritis, plaque psoriasis, and ankylosing spondylitis. A biologic is a medication made from live cell cultures, as opposed to in the lab, the way most medications are made—or were, up to now. In fact, the biologics are ultimately made of (I really could not make this up) Chinese hamster ovary cells. However, because the medication is made from live cells (as is Humira, whom you'll meet soon), the human digestive system would wreak havoc with it. Therefore Enbrel cannot be taken orally; it has to be injected under the skin. Obviously this is not a simple process. The majority of biologics must be administered in a hospital; Enbrel is one of the few that has a system that allows the patient to purchase it at a pharmacy and self-inject it. In complete opposition to antibiotics (heal and goodbye), biologics--Enbrel included--are what people are now calling lifestyle drugs," which, writes Pollock, are "meant to enhance life rather than extend it." And people who need them never really stop needing them. That can be nothing but good for drug-makers Amgen and Wyeth. In fact, biologics already make up nearly a quarter of the $320 billion that the US spends every year on medications. To help Enbrel's makers along with their profits, there's both the drug's high cost--as of 2012, one month of Enbrel cost $1,500--and the golf player. Yes, you read right. Famed golf player Phil Mickelson is a paid spokesperson for the drug--he's even approved by the FDA--and he has a featured spot on Enbrel's website, does TV ads, and appears in third-party publications. Beat that Zyprexa (#6, with a paltry worldwide market of $5.3 billion). Sold as Seretide outside the US, GlaxoSmithKline's drug treats asthma and chronic lung disease caused by smoking--although clearly managing episodes is, again, far from a cure. Pollock writes that, after World War II, drug companies moved from treating infectious diseases to treating chronic, potentially degenerative diseases, like heart disease and asthma. Thus a bunch of blockbusters in this category offer to reduce the risks of dangerous diseases, thereby promising to extend life. Sounds pretty good. GlaxoSmithKline launched their drug in the US in 2001--with supreme confidence. They claimed they expected US sales to top $1 billion. And they put forth some efforts to make sure that happened. ThePharmaLetter claims that their "marketing effort [was] of unprecedented scale in the history of pre-merger firms. . ., with 2,300 sales representatives scheduled to visit some 70,000 US doctors, responsible for writing 80% of asthma prescriptions, in the first week." Of course this went along with an intense direct-to-consumer advertising campaign. As of 2010, GlaxoSmithKline was spending $200.5 million on advertising--for Advair alone. It clearly paid off for them over time. During just the first half of 2013, Advair earned $4.31 billion, putting it in place to earn $8.6 billion in sales for the year. But what is truly unique to Advair is that it has already come off patent and it's still bringing in billions like that. This has something to do with how complex the drug's formulation is--it's a combination of two asthma drugs plus a unique delivery system--and it's just simply difficult to replicate. In fact, Teva Pharmaceuticals, the world's largest maker of generic medicines, claimed in October that it didn't expect to see generic copies of the drug any time before 2018. Humira, a drug that treats auto-immune diseases, is the come-from-behind winner to the top 5. It is currently the best-selling drug in the world, and has earned maker AbbVie $4.85 billion in the first 6 months of this year. One commentator points out that it just "may be easier to look at what it isn't approved for than what it is!" So here--and with Embrel--we move beyond the management of heart disease or high blood pressure--and move to "lifestyle drugs" (what some call "designer drugs"), which, writes Pollock, are meant to "enhance life rather than extend it." Originally approved by the FDA for treatment of rheumatoid arthritis on the last day of the year in 2002, Humira has since received approval for numerous other conditions, none of which hurts the company's bottom line. In 2005 it was approved for psoriatic arthritis, and that year, for the first time, brought in $1 billion annually. Approved for ankylosing spondylitis in 2006 and Crohn’s disease the next year, by 2007 it was bringing in $6.4 billion annually. Lest we miss anything, the drug was also approved for plaque psoriasis and juvenile idiopathic arthritis (both in 2008)--and just last year received the go-ahead for ulcerative colitis. With all those notches in its belt, it is no surprise that as of last year, a year’s treatment on Humira could cost up to $20,000. Clearly, the drug in the #1 spot had a tremendous head start in that it came out in 1996, nearly 7 years ahead of Humira. But Forbes tells us that, "based on cumulative revenue performance (i.e. years 11 to 15 on the market), Humira is forecast to outperform [the #1 drug] with global revenues of $69 billion versus $63 billion. Furthermore, Humira is forecast to record higher cumulative sales during this subsequent five-year period, compared to its first 10 years of availability. (Enbrel shares) this characteristic." Because they treat autoimmune diseases, neither Enbrel nor Humira (nor others of its ilk) will ever be taken by millions like drugs that were in the lead for years, nor will they become household names--like the drugs perched tentatively in spots #1 and #2 today. Both of these biologics are extremely costly--keeping them, for the moment, out of the third world--but they do make a difference to some very sick people, who can regain significant functioning thanks to them. Between their cost, their effectiveness, and the loss of patents that have already hit the drugs in the first and second slots. . .well, the table at the end shows a very different picture of bestselling meds from what we’ve been used to seeing for years. Gripping its number two spot before the biologics knock it off its perch as a bestseller is a blood thinner made by Bristol-Myers Squibb and Sanofi-Aventis. Plavix was on the market for two years, its use growing steadily, when Bristol-Myers Squibb launched a major advertising campaign for the drug in 2001. Over the next five years, the drug company spent $350 million in direct to consumer advertising. Although the end result was money in the drug company's pocket, it's of interest that all those ads didn't actually lead to growth in Plavix sales; they grew at the same rate as they had done before the advertising blitz. What did increase was the cost of the drug; researchers found "a large, sudden, and statistically significant increase" of 12% in the cost of a Plavix prescription. However, either way it was good for the bottom line. On May 17, 2012, Plavix, Bristol-Myers' cash cow (during its 15 years on the market, it made up almost half of the company's US sales, or an estimated $42.8 billion), bit the pharmaceutical dust as it went off patent, to await being overtaken on the all-time best-seller list by a biologic. But you've got to hand it to Plavix for stick-with-it-ness, if nothing else. By 2010, doctors and those who followed the trends in prescriptions were ready to declare generics "king." In fact, only three brand-named drugs remained on the list of the most commonly prescribed medications that year, according to the IMS Institute for Healthcare Informatics report, "The Use of Medicines in the United States: Review of 2010." And our Plavix is one of them (if you wait just one second more, you'll find yet another, currently precariously holding the top spot). For years Lipitor has stood head and shoulders above the rest as the bestselling drug of all time. Over the period when it had patent protection, Lipitor earned about $131 billion in cumulative sales, which is more than twice that of Plavix, in the number 2 spot. But back to our story. When it was being developed, Lipitor was already the fifth in a drug class called statins, which lower LDL (what we call "bad cholesterol"). In fact, there were already two blockbuster statins ahead of it in line (Zocor and Pravachol, both approved by the FDA in 1991). But then Lipitor got a lucky break. Pfizer, makers of Lipitor, benefited from some charmed timing: Lipitor went on sale in 1997, the year the Food and Drug Administration decided to allow drug ads that targeted consumers. So Pfizer went on a spending spree, putting millions of dollars into ads (many during the then-extremely-popular TV medical drama, "ER"). As of 2010, Pfizer was spending $272 million a year on Lipitor advertising alone. But they didn't stop there. They trained. . .what can we call it but an 'armed force'?--of over 2,000 sales representatives, and in the first year after the drug's launch, they ratcheted up nearly one million visits to doctors to ‘encourage’ them to use the drug. Often such conversations took place, according to FT Magazine , over long, lovely meals in pricey restaurants. In the meantime, health groups continued to lower cholesterol targets in national guidelines, which, of course, meant that millions--literally--more patients were now candidates for statin treatment, as recent research had clearly indicated the link between cholesterol levels and heart attacks. And if they needed a statin, well, why not Lipitor? One health writer asserts that, "The Lipitor promotion team set new standards for a marketing campaign." They visited, and then re-visited--and then re-visited again--not just cardiologists but also family doctors, showering them with data that indicated that Lipitor was the best cholesterol-lowering medicine on the market--and, of course, perfectly safe. And they were free and loose with giving samples of that now-famous white pill. By 2004 Lipitor had become the world's first mega-blockbuster, a new word, to be sure, as a new word was necessary to define earnings like this, with annual revenues of over $10 billion dollars. Having been prescribed to over 17 million people, it earned Pfizer over $100 billion during its run. But all giants must fall, and Lipitor's patent expired on November 30, 2011. By the 4th quarter of 2012, Lipitor sales were down 91% in the US and 71% worldwide. Still, its run seemed sure to guarantee it the top spot, well. . .forever. But little could Pfizer know then that their Lipitor, a drug that earned more than double any other drug in the history of the world, a drug that had been the bestselling drug on top 5 lists for years, was nearing the end of its dominance--and that a whole new concept in medication would topple it, and in fact its entire class, from bests telling drug lists. They could hardly have imagined that, as of 2014, no predictions for bestselling drugs of the future would have Lipitor even in the top five. Reuters' predictions don't even include it even among the top 10 for 2014 (top 3: Avastin, Humira, and Enbrel), and EvaluatePharma doesn’t have it in the top 50 for its predictions for 2018 (top 3: Humira, Januvia, Enbrel). In addition, drug companies increasingly focus on products that can generate the highest profits. The majority of drugs approved by the FDA are now expensive specialty drugs. Many drug companies are also pursuing “orphan drugs” — medicines targeting diseases that afflict fewer than 200,000 people. These medications cost an average of $140,000 a year. The catch: Many orphan drugs eventually receive additional approvals as a treatment for other conditions, dramatically increasing the market for the drug. In fact, the industry described above is responsible for the development of medicines to save lives and alleviate suffering, not the generation of profit for its own sake. Stripping out the one-off $n (?6.n) the company made from spinning off its animal health business leaves a margin of 24%, still pretty spectacular by any standard.